Ponds remain a firm favourite in the garden and Thrive Landscapes have been involved with some very successful pond and water features in the past few years, benefiting from a large variety of projects. 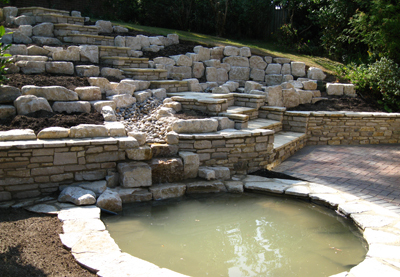 From natural wildlife pools and bog gardens to grand ornamental ponds with cascade waterfalls or natural stone water courses. As with the garden as a whole, the planting around a pond or rockery can make or break it, and Thrive landscapes are able to advise you on suitable plants even if you want to do the planting yourself. Timber structures add instant height and impact to a garden, an aspect we are very familiar with. We have produced Pergola's and Archways of all shapes and sizes, whether free standing or adjoining a building. Decking is also still popular as a flexible alternative to traditional slab patios, and we are able to supply both hard and softwood deck boards, as well as a large range of balustrading for definition and safety. 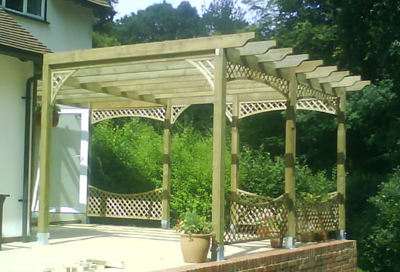 We can also advise on pergola planting and timber aftercare, to keep it looking as you want for years to come.